← BB makes me sick! Bernanke´s book Courage to Act was released today. I´m not much curious about the backstage discussion of how best to rescue the financial system or the “excitement” about Lehman because I fear that much of that was a consequence of monetary policy mistakes, so I will mostly want to read about his views on the monetary policy the Fed was pursuing. I have the feeling he forgot about Friedman´s first and second dictum about what monetary policy can do. For practical central bankers, among which I now count myself, Friedman and Schwartz’s analysis leaves many lessons. What I take from their work is the idea that monetary forces, particularly if unleashed in a destabilizing direction, can be extremely powerful. The best thing that central bankers can do for the world is to avoid such crises by providing the economy with, in Milton Friedman’s words, a “stable monetary background“–for example as reflected in low and stable inflation. A second thing monetary policy can do is provide a stable background for the economy. 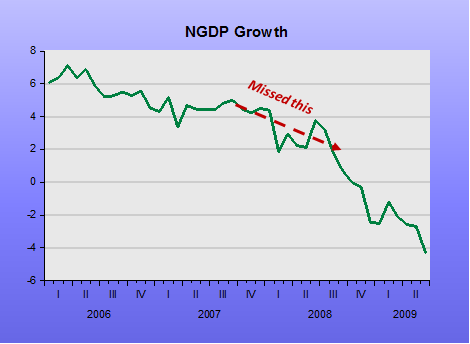 If instead of low and stable inflation he had pursued a stable growth path for nominal spending (NGDP) he would have avoided the crash. The absence of a clear and straightforward measure of monetary ease or tightness is a major problem in practice. How can we know, for example, whether policy is “neutral” or excessively “activist”? Unfortunately, he preferred to concentrate on inflation, and worse, the headline variety, which was being buffeted by the oil and commodity price shocks! This entry was tagged Courage to Act, Healine Inflation, NGDP Growth. Bookmark the permalink. Great post… short and to the point. Poor Bernanke, the Fed-borg worked him over and didn’t leave anything recognizable behind. Which is one of the reasons I don’t plan on buying his book. I don’t think I could take reading about him donning a red cape in the telephone booth and they flying off to save the world. There’s plenty of more interesting fiction to read. You might be interested in these passages from Bernanke’s new book (Chapter 19 on QE1). I think they contradict each other. 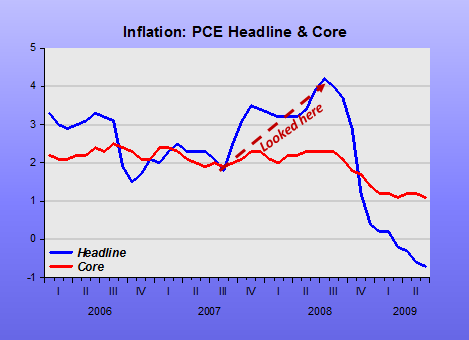 Well, if you guys make enough noise about this on your blogs, Bernanke himself might provide clarification on his blog. It seems to me that, while Bernanke was discussing QE1 in 2009 in his book, your post above discussed QE3 in 2012 and 2013……. Travis, Tell that (SS right about everything) to Ray Lopez! Right, it´s the same story. This one covers QE1! Thanks for linking to that post. However, even after reading it, it’s still rather mysterious to me why, within 24 hours, the yield on the ten-year treasury fell from 3.02% on 3/17/2009 to 2.51% on 3/18/2009 (Bernanke mentioned that in the passage I linked to). Worse, they take up so much comment space that some worthwhile comments may be missed! Travis, notice that that only occurs for QE1. Maybe it was a very short liquidity effect. After all, at that point everything was still “fluid”, and liquidity hard to come by. The income effect quickly asserted itself. Thanks, Marcus. It would be nice if Bernanke wrote something new about the liquidity effect, inflation effect and growth effect and how they tend to drive interest rates in opposite directions. I wish we could be successful in changing the monetary conversation away from interest rates, the wrong goal, to NGDP, for general welfare reasons as well as personal ones – I have to turn my brain inside out to get into it and it seems like a confusing and unnecessary complication for no real benefit. Bonnie, most people are comfortable with the received wisdom. Even those, like Bernanke, who knows the “truth”, cannot converse differently, so the wisdom “cristalizes”. Any other language is totally foreing and not understood. It will take many years for that to change.